Groovy's regular expression support is based on the excellent regular expression library that ships with Java in the form of the java.util.regex package. The regex engine is very fast (by any standard, not Java standards), and the regex flavor very comprehensive. RegexBuddy makes it very easy to use the power of regexes in your Groovy source code. If you copied a regex written for another programming language, simply paste it into RegexBuddy, select the original language, and then convert the regex to Groovy and the specific version of the JDK you're working with. If you're writing a code library that needs to work with multiple versions of the JDK, compare your regex between those JDK versions to make sure it will work exactly the same with all of them. 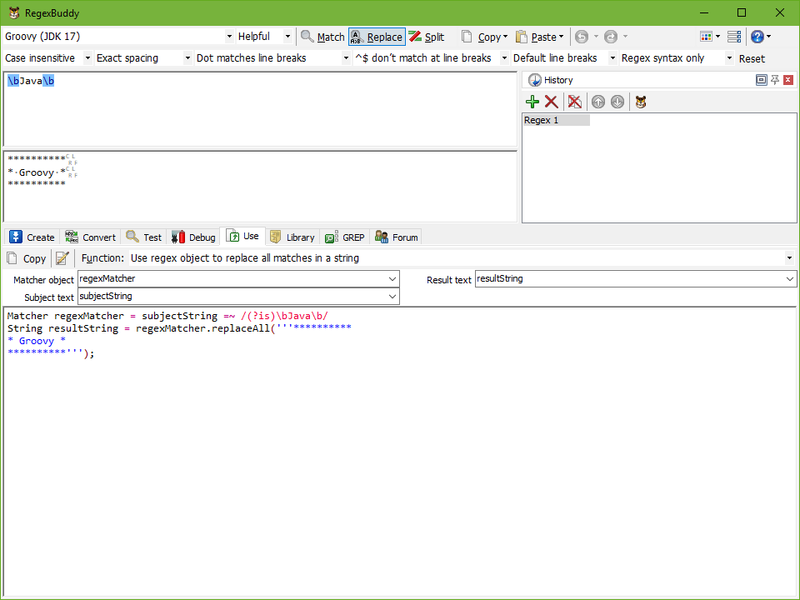 If you created a new regular expression, test and debug it in RegexBuddy before using it in your Groovy source code. Test each regex in RegexBuddy's safe sandbox without risking precious data. Quickly apply the regex to a wide variety of input and sample data, without having to produce that input through your application. Finally, let RegexBuddy generate a source code snippet that you can copy and paste directly into Eclipse or whichever IDE or Groovy code editor you use. Just choose what you want to use the regex for, and a fully functional code snippet is ready. You can change the names of variables and parameters to suit your naming style or the current situation, which RegexBuddy automatically remembers. Don't bother trying to remember which classes to use or which methods to call. And don't worry about properly escaping backslashes and quotes, or figuring out which of Groovy's five string styles yields the fewest backslashes. Just tell RegexBuddy what you want to do, and you will get the proper Groovy code straight away. Anything can be done: testing a string for a match, extracting search matches, validating input, search-and-replace, splitting a string, etc. Choose whether to create a reusable regex object for best runtime performance, or whether to use a one-line convenience function for maximum source code readability.